Until its destruction in the 16th century, Hampi was numbered among the richest and largest cities in the world. The now ruined remains of this imperial city are set amidst a beautiful boulder strewn landscape on the southern banks of the River Tungabhadra and are considered to be amongst the most magnificent in India. This private chauffeur driven tour spends three nights in Hampi and has been designed for the cultural enthusiast looking to travel off the beaten track in quest of Karnataka’s rich and fascinating past. Along the way you will also discover the wonderfully elaborate ruins of the great Hoysala Empire at Belur and Halebid in addition to exploring the palaces and fortresses of the princes of Mysore and Tipu Sultan. Travelling through the verdant landscape of the Western Ghats will enable you to experience the working coffee estates and beautiful misty hills of Coorg, as well as spend two nights immersed in the wilderness amongst the habitat of tiger, wild Asian elephant, gaur at Nagarhole National Park on the serene Kabini River. A three night stay in Hampi, the remote imperial capital of the Vijaynagara – the last great Hindu empire to rule over southern India would be the high-water point of many tours, but is just one of a series of breathtaking historic and scenic attractions on this stunning private chauffeur driven journey through the often overlooked southern state of Karnataka. Day 3 Mysore and Somnathpur. Day 5 Early morning and late afternoon game drives. Day 7 Visit coffee plantation. Afternoon at leisure. Arrive Bangalore Airport. Afternoon tour Tipu’s Summer Palace. Arrive Nagarhole. Afternoon game drive. Early morning game drive, arrive Coorg. Visit coffee plantation. Afternoon at leisure. Drive to Hubli and fly to Mumbai. Explore the iconic Amba Palace in Mysore. Search for Asian elephants at Nagarhole National Park. Enjoy a guided walk through a coffee estate. Admire the exquisite stone sculptures at Belur and Halebid. 4 nights: Discover Bekal & North Kerala. 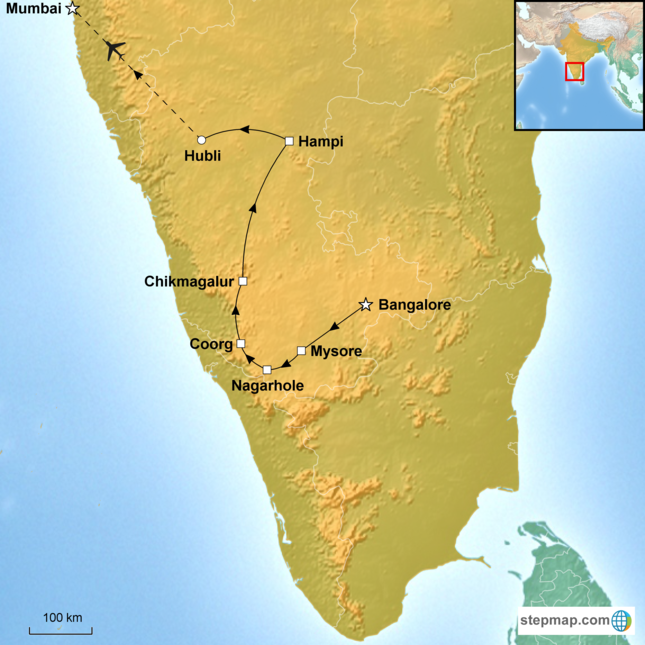 6 nights: Explore Deccan Sultanates.